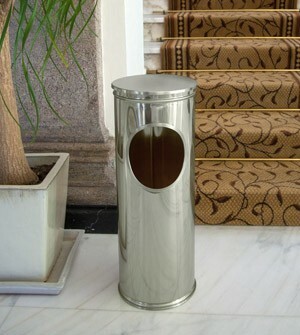 Umbrella stands and waste paper bins by Apir are useful tasteful furnishing elements. All Apir's metal umbrella stands are customisable in finishings and colours and are suitable for all environments. Umbrella stands are available in two styles, classic in a round profile with a special decor, modern with a squared profile in painted metal . Waste paper bins are presented in two shapes, cylindrical suitable for the most classic and traditional environments and a rectangular one suitable for the most modern and contemporary environment. All umbrella stands and waste paper bins are designed by Apir (design made in Italy) and are manufactured in-house to preserve the quality of Italian craftsmanship; they are suitable for hotels, bars, offices but also companies, museums and shops.